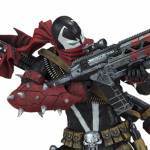 Now saluting his 25th anniversary of revolutionizing the toy and comic industries alike, comic book legend Todd McFarlane deploys his Commando Spawn 7-inch figure with assault rifle, pistol, and sniper rifle accessories! The highly-detailed Commando Spawn figure also comes painted in 2 rare variant colors, metallic gold and silver to honor his years of service in the toy aisle. One, what does Color Tops mean? Two, why even add articulation to a figure that is essentially a small plastic statue? I miss real Spawn figures. Color Tops is the name McFarlane uses for their entire 7" scale licensed figure assortment. Each wave comes in a different colored top to the box (Red Wave, Green Wave, etc.). They haven't, but they should. I'd absolutely love an articulated Spawn figure like the way they were making the Walking Dead figures. Or at least how they used to make them before they switched to these "action statues" or whatever you wanna call them. If you're not going to bother with real, practical articulation, then why break up the sculpt of the statue with all sorts of cuts everywhere? Why? McFarlane is completely worthless, both as a name and as a company. By your logic, NECA might as well buy a fresh dog turd. Except he didn't create The Maxx. Sam Kieth did. I'm not sure I know what you mean. Aside from the Maxx figure that McFarlane produced, he hasn't really done anything with that character. 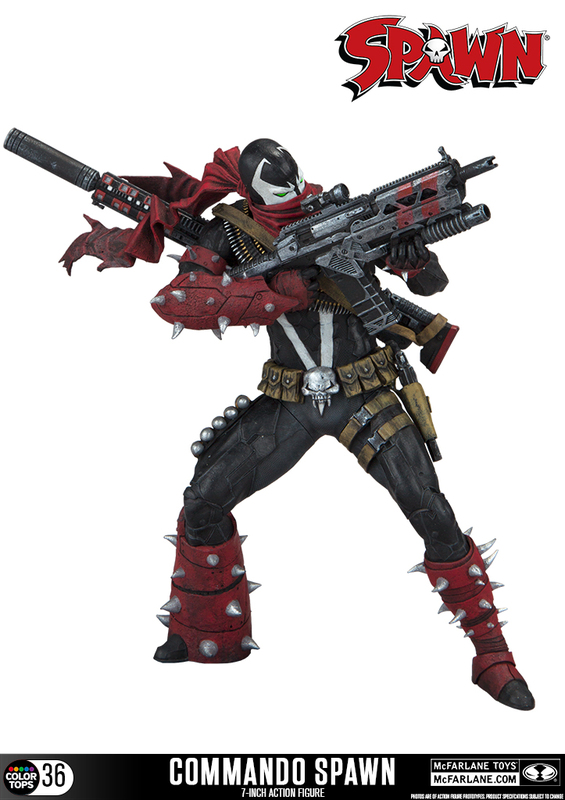 I do agree that McFarlane needs to get with the times and make super articulated Spawn figures in the same vein as Marvel Legends. They would certainly sell very well. If he feels that the articulation is worthless then why were the figures from Walking Dead fully articulated or as previously mentioned even bother with it when it comes to these newer figures? Sorry but that doesn't make any sense. that made no sense at all, articulation, worthless? thats the backbone of collecting!!! collectors dont want static figures unless you are a statue collector but that another beast. his lo$$. Depends on the collector, I don't mind static figures, it's almost a preference because when you trade for articulation, you lose aesthetic unless you're buying a premium like Hot Toys. I would love it if they can execute Spawn with great articulation that doesn't hurt the design....it's a huge turn off when I see visible joints. I prefer static figures, since I stand them up on a shelf and never touch them again, for the most part. I should be a statue collector, but am not for these reasons…Cost, Selection, and Size. if you want articulation the joints will be visible unless they put the clothing on top. cant have it both ways. I prefer static figures, since I stand them up on a shelf and never touch them again, for the most part. I should be a statue collector, but am not for these reasons�Cost, Selection, and Size. yeah, thats pretty much my story as well. Personally, I just can't collect static figures or statues. My figures have to have the basic ability to move, or I just don't know what to do with them. For me, visible articulation can sometimes be part of the aesthetic that I like about figures.